Photograph of school children who attended the old Paxico City School during the 1905-06 school year. The teacher of the primary school was Marie Hargrave. First graders are identified as Georgie Banks, Lossie Lax, and Emma Johnson. 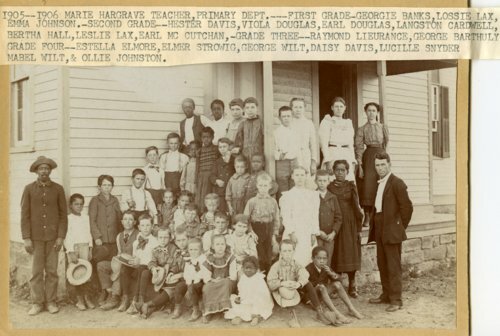 Second graders are identified as Hester Davis, Viola Douglas, Earl Douglas, Langston Cardwell, Bertha Hall, Leslie Lax, and Earl McCutchan. Third graders are identified as Raymond Lieurance and George Barthuly. Fourth graders are identified as Estella Elmore, Elmer Strowig, George Wilt, Daisy Davis, Lucille Snyder, Mabel Wilt, and Ollie Johnston.